The following list contains the format codes that you can use in headers and footers. Left-aligns the characters that follow. Centers the characters that follow. Right-aligns the characters that follow. Turns double-underline printing on or off. Turns superscript printing on or off. Turns subscript printing on or off. Turns bold printing on or off. Turns italic printing on or off. Turns underline printing on or off. Turns strikethrough printing on or off. Use CHR(10) to insert a linefeed character. Use CHR(13) to insert a carriage return character. The article also includes the VBA to create a macro that will insert header/footer information. 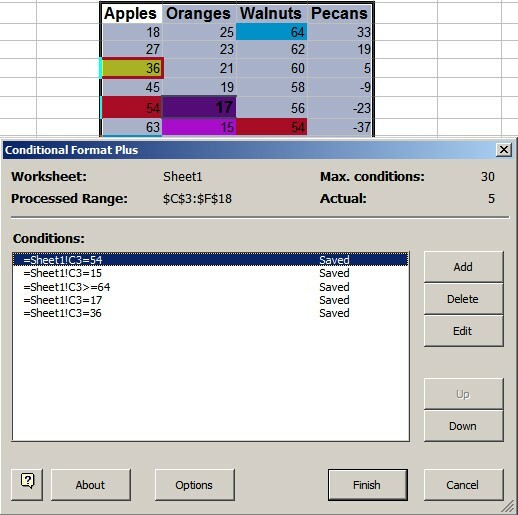 Conditional formatting is one of Excel's better features. It allows you to preset certain font styles, colors, and cell-background colors based on cell values. This can be very useful for highlighting important information and values outside an accepted range or providing a visual cue to associate value ranges with color codes. The best part is that conditional formatting is very easy to set up. Just click the cells you'd like to format and select Format >Conditional Formatting. The Conditional Formatting dialog box lets you set up the conditions by which the formatting of the cell will occur. You pick the operator (between, equal to, less than, etc.) and the value or range of values. 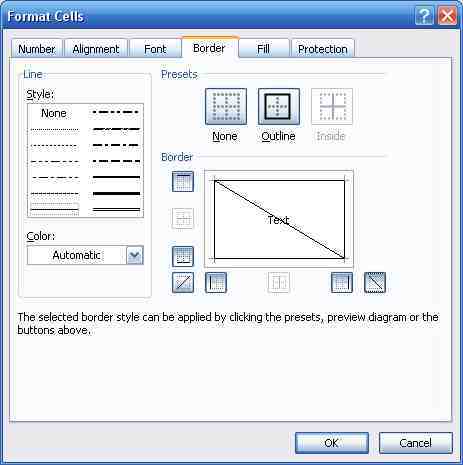 Click Format to open the Format Cells dialog box, where you can select the colors and styles to be used. 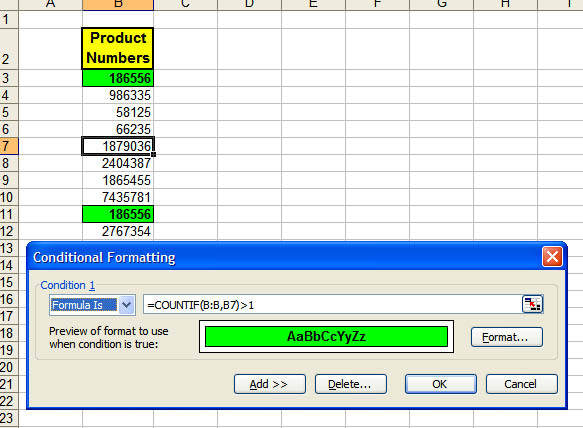 Each cell can have several conditional formats. For example, you might say that if a certain cell's value is between 20 and 50, the text should be blue on a yellow background. However, you can format that same cell to exhibit red, bolded text on a green background if it contains a value between 51 and 100. Before 2007, you could use up to three conditions, but earlier versions of Excel can be tricked to use more if it should become necessary. When you copy information from a Web page or another document, the formatting will also be copied. To match the formatting of the target document, copy the text and place the cursor where you want to insert the copy. Then, go to Edit>Paste Special, and select the Unformatted Text option. The clipboard text will be pasted to match the target. the lower right corner of the pasted text. You can then choose to keep the original formatting, match the destination formatting, keep text only, or apply a new style. An additional way to transfer just the formatting between documents is to highlight the text with the formatting you wish to copy and then hold down the Ctrl key and the Shift key and press the C key (Ctrl+Shift+C). Release the keys. Select the text you want to have formatted. Hold down the Ctrl key and the Shift key and press the V key (Ctrl+Shift+V). Only the formatting is copied, not the text. 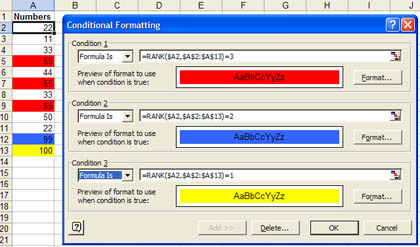 In Excel use Edit>Paste Special and select the "Formats" option. Paste Special can also be used with graphics. You can change Word's default behavior; choose whether to paste Inline or Floating. Avoid applying formatting to more than just the active area of your worksheet. Extraneous formatting will confuse Excel about the last cell in the spreadsheet. Depending on your OS and specific configuration, you could see symptoms ranging from Excel not responding to various error messages concerning page faults, low virtual memory, and access violations. You may see a warning message; "Too many different formats." To resolve this issue, make sure you select only the particular range of cells you want formatted when you apply specific formatting or select Format>AutoFormat. You can use Ctrl+End to see where Excel thinks the last cell is. Mark Rowlinson provides a discussion by Kid Van Ouytsel that does an excellent job explaining data validation. He has also constructs a sample workbook that you can download and play with. "Data validation is a tool that can help you control the input/changes someone can make in a spreadsheet. It can help you or your users to make choices, guide them to make relevant input/changes, or restrict input to a specific type of data or structure. It can help you or your users to save time and to keep formulae working properly." Here's a link to the code that produces conditional formatting on the fly to the cells in the current row and column. Duplicate entries can be formatted to "disappear", but still be available for computation. Select a font color to match the cell background color. Select a font or background color for highlighting. Microsoft Office Word, Microsoft Office Excel, and Microsoft Office PowerPoint versions 2000 through 2003 cannot natively open documents that are stored in the Office Open XML Formats in 2007 Microsoft Office programs. You can install the Microsoft Office Compatibility Pack for Word, Excel, and PowerPoint 2007 File Formats to open or to save 2007 Office files. You can open Word, Excel, or PowerPoint 2007 files by double-clicking them exactly as you do with your existing Word, Excel, and PowerPoint presentation(s). You can save Word, Excel, or PowerPoint 2007 files by clicking the Save button in your version of Word, Excel, or PowerPoint. After you install the Compatibility Pack, you can open, edit, and save the document file formats that are new to Word 2007 within Word 2000. You can open files in the formats that are new to Word 2007 by double-clicking the files. You can save files in the formats that are new to Word 2007 by clicking Save in Word 2000. After you install the Compatibility Pack, you can open and save the file formats that are new to Excel 2007 and to PowerPoint 2007 from the Microsoft Windows operating system. You can open files in the formats that are new to Excel 2007 and to PowerPoint 2007 by double-clicking the file on the desktop, in the My Documents folder, or in Microsoft Windows Explorer. You can save files in the formats that are new to Excel 2007 and to PowerPoint 2007 by right-clicking an Excel 2000 file or a PowerPoint 2000 file and then clicking Save As.